You know those people who seem to have a web profile (facebook/twitter/msn/and occasionally *gasps* even blog) simply to complain? I’m talking about the girl who constantly updates facebook statuses saying she’s fat, expecting of course, a prompt comment arguing “no you’re not”, which of course leads to a list of fifty some comments which basically consist of “yes I am”s and “no you’re not”s. Or the collegiate who constantly updates his twitter announcing how busy he his because of so much homework, or the ever present complaint about college tuition. Don’t get me wrong, every once in a while it’s nice, and necessary to vent, and rant about things. But a constant stream of negativity, is simply annoying! I’m writing this post, because I think many “complainers” don’t notice they’re considered complainers. I have deleted or at least limited posts from quite a few people on my facebook, because all of their statuses were repeats of their previous outbreaks. Instead, I have managed the posts I receive to be those of people who are always publishing something positive about their life, not the rants against professors, against family, against coworkers, against church members, and of course, the despaired “I can’t keep up with all of this” rant. Many “I can’t keep up”s of life could be avoided by simply stepping away from the computer and not posting that status. Family matters should be kept private. Complete strangers don’t need to know about your family problems, because one day you all will probably reconcile anyway, even if it doesn’t really seem likely at the time. Here’s the thing, if you can change something, quit complaining and go change it! If you can’t change something, or are not willing to, then for your own good, put a cork in it! Oh I get it, it’s your profile, it’s your blog, true! But don’t you want to attract people to yourself and what you have to say? Are you saying to yourself that you really don’t care? Don’t kid yourself, you know you do care. But see, that’s the key! Don’t dwell on the bad, on the horrible, on the dark and dreary. Instead, play the glad game! Am I saying be fake and hide behind a smile? Not exactly. I’m just asking you to try to see things in a better light, and to always remember that someone out there is going through exactly what you’re going through, and someone out there, is even having it worse. I know, that’s impossible, but there really are people out there that have a life worse than yours. Someone in your own town too. I’m not referring to the poor, hungry kids in third world countries. I’m referring to people around you. Some people, don’t have access to the Internet. In fact quite a many people don’t, and what could be more horrible than that right? All I’m trying to say, is next time you are tempted to post a status, tweet, or a blog post ranting on your horrible, terrible, life. Think twice. Think if maybe it wouldn’t be better to write about it after you’ve calmed down some. Think about if it’s actually that big a deal that the cookies you wanted were sold out? 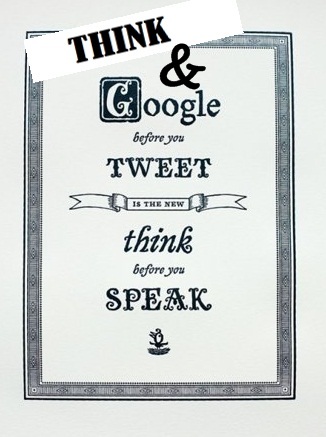 The same policy that goes for speaking, (think before you speak), goes for publishing your thoughts on the web as well. That way, you can avoid becoming the “complainer” friend, and become the uplifting one instead. P.S. Save the link to this post, if I ever resort to complaining on the web, you’ll know what to tell me. Photo Credit: Internet & edited by me. It's ok, I hate misspellings, but I'm unfortunately guilty of having accidentally misspelt words on occasion. I just do my best to avoid it. Haha, well, we have to do what we have to do! I hope that problem won't damp your Holidays! Hahaha, I just read you hate misspellings, and I found a misspelling in my comment, LOL! Well, my problem won't go away easily, but I'll fix it. By looking for another job. Ha! That a girl! Those are the people I admire (: Get up && do somethin' people! Awesome! Have a lovely Monday, and I'll be sure to keep you in my prayers Your problems will go away soon. Don't worry about it. I agree (about the getting attention thing). I feel quite much like a complainer myself, especially lately, because of problems at work, a situation that occupies my mind day and night. My blog is my place to vent. But after a while I get tired of my own writing… and then it's time to write about something else. And to get my *** of the couch and do something about it. actually you're not disagreeing at all. You are positively right. It's wonderful to read open and raw content. What I'm writing about, are the posts that clog up my news feed, primarily on twitter and facebook, that are just a load of people who are going about getting attention the wrong way. Their problems fit into the “first world problems” category, they're not true heartfelt problems. Personally I don't have a problem with people venting on their blogs or whatever, as long as it is venting and just not silly little things like “i'm fat”. I completely agree with this! Thank you for posting it!